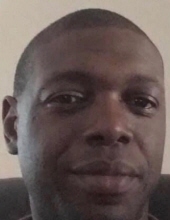 Jason Sylvester "TJW" Wigfall, 43, of Jacksonville, departed this life on Tuesday, March 19, 2019. Jason will be forever cherished by: his life partner, Charles "Chuck" Bonavita; his Mother, L. Kate Walker; brothers, Clifford S. Wigfall (DeAndra) and Theron S. Wigfall (Kiah Hickman); and a host of other relatives and dear friends. The service Celebrating the Life and Legacy of Jason Sylvester "TJW" Wigfall will be held on Saturday, March 23, 2019 at 11:00 AM in the St. Julia A.M.E. Zion Church, 112 Kerr St., Jacksonville. AT THE REQUEST OF THE FAMILY, NO FLOWERS WILL BE ACCEPTED BY THE FUNERAL HOME FOR THIS SERVICE. In lieu of floral arrangements, please make memorial contributions to the funeral home in Jason's name. Professional Service and Personal Care are being rendered to the Wigfall and extended families by the staff of Morgan Funeral Home, Inc. and Cremations, Jacksonville (910) 347-9595. To send flowers or a remembrance gift to the family of Jason Sylvester Wigfall, please visit our Tribute Store. "Email Address" would like to share the life celebration of Jason Sylvester Wigfall. Click on the "link" to go to share a favorite memory or leave a condolence message for the family.